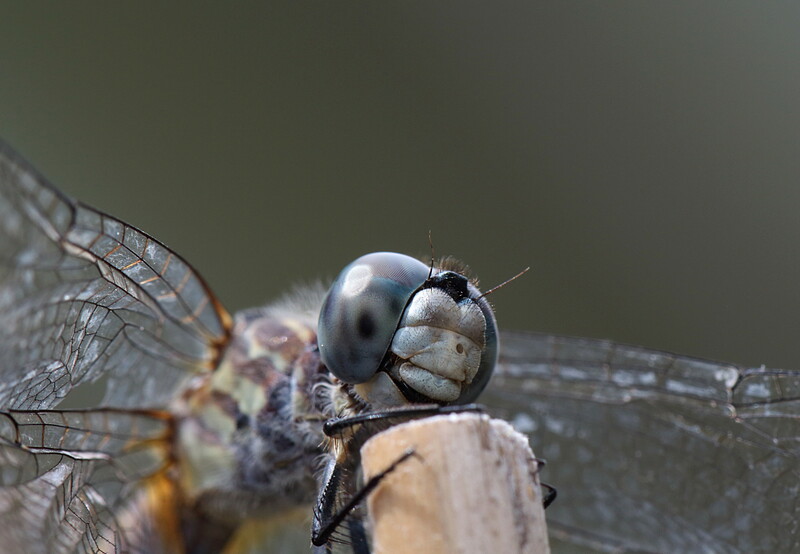 Today we’re featuring the insect photos of Mark Sturtevant as well as a single photo from PCC(E). Mark’s captions are indented. Here are more pictures of arthropods from the summer of 2017. The first pictures are of a kind of bee, and it is not being nice. It is a kind of ‘cuckoo’ bee, a parasitic bee that lays its eggs in the nests of other bees. Like many of its kind, it is not particularly fuzzy since it has no need to gather pollen for its young. Rather, it makes other bees do that for it. This one is likely in the genus Nomada, but I am not sure of the species. 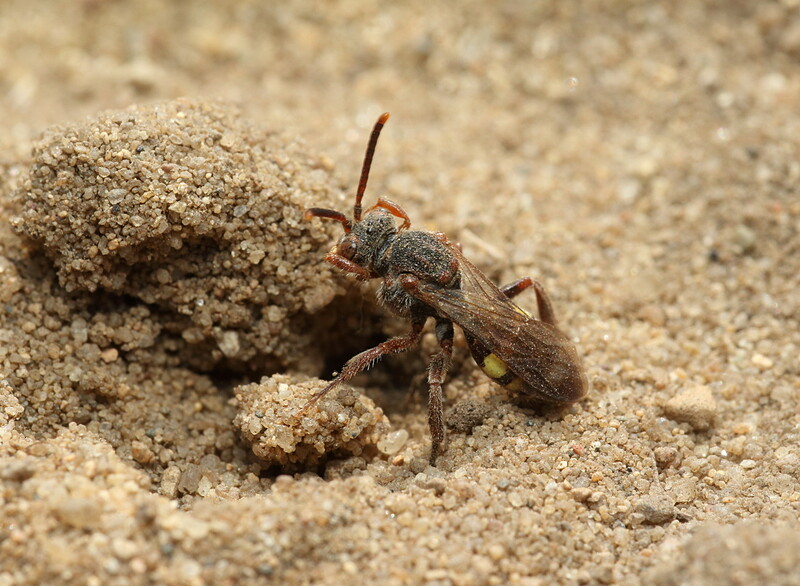 In any case, the cuckoo bees in this group typically parasitize Andrenid bees that nest in the ground. This one was carefully inspecting a small area, and then it dug into the ground. 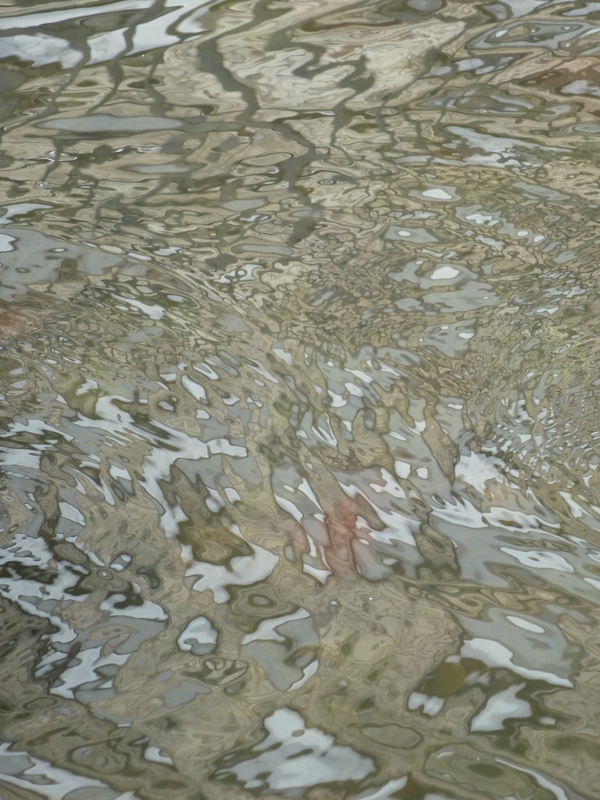 It later reappeared after several minutes, cleaned up, and repeated the process. Seems pretty suspicious to me! 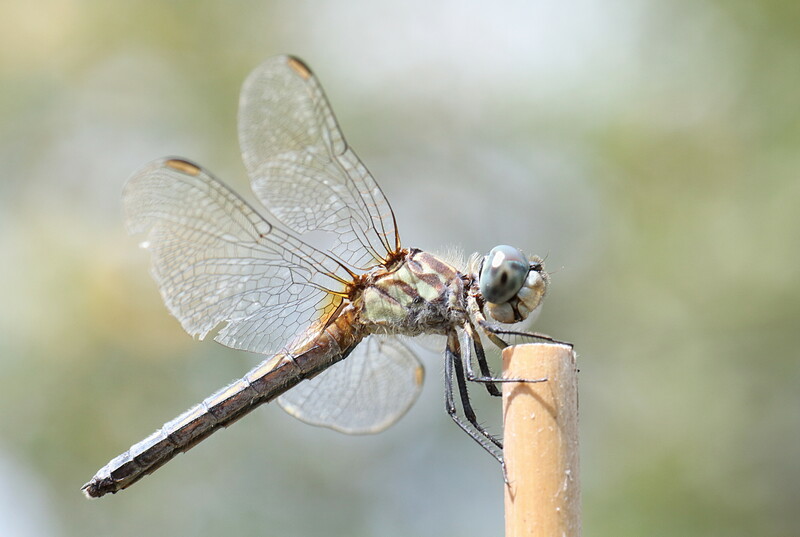 The next two pictures are of a female blue dasher dragonfly (Pachydiplax longipennis) that was a regular visitor to a garden stake in my back yard. You can see that she allowed me to get surprisingly close. 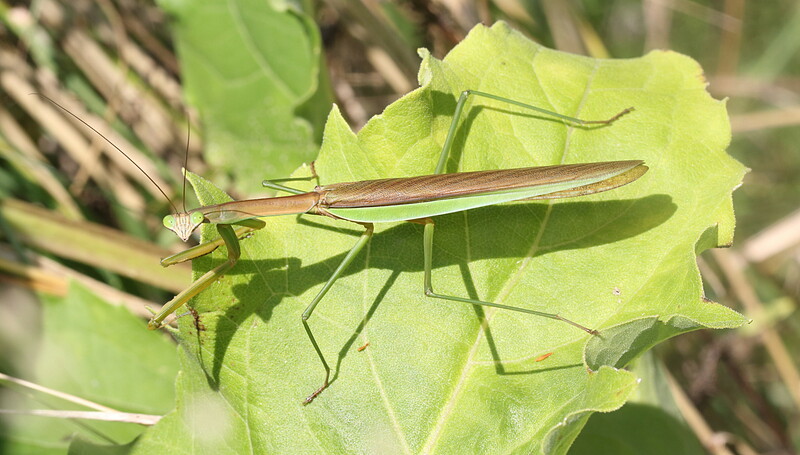 One day when I was on my way out of a park, I just happened to glance down to notice a large Chinese praying mantis (Tenodera sinensis). This is a male, and isn’t he adorable? 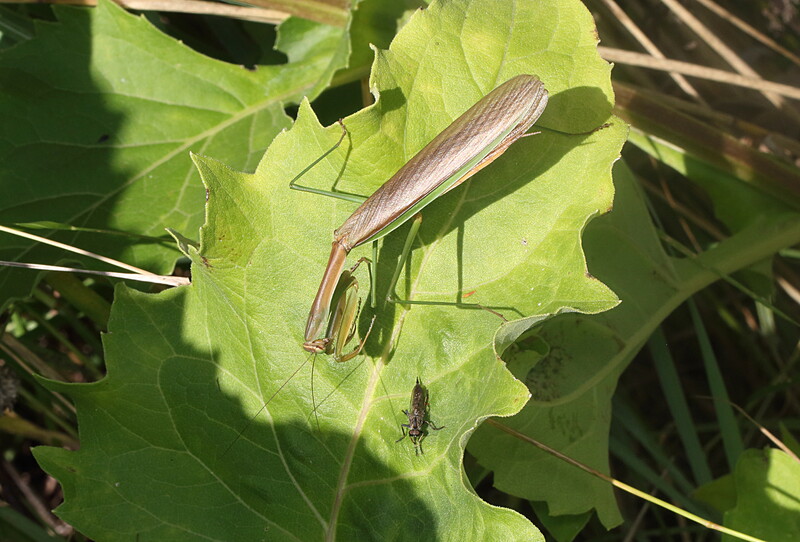 At one point a robber fly unwisely landed next to it, and so I watched with bated breath to see if the mantis had a meal. It struck a fraction of a second after the last picture, but the fly sort of slithered out from the raptorial arms and escaped. During the summer I visited my mother, who now lives in a retirement community near our home town in Iowa. 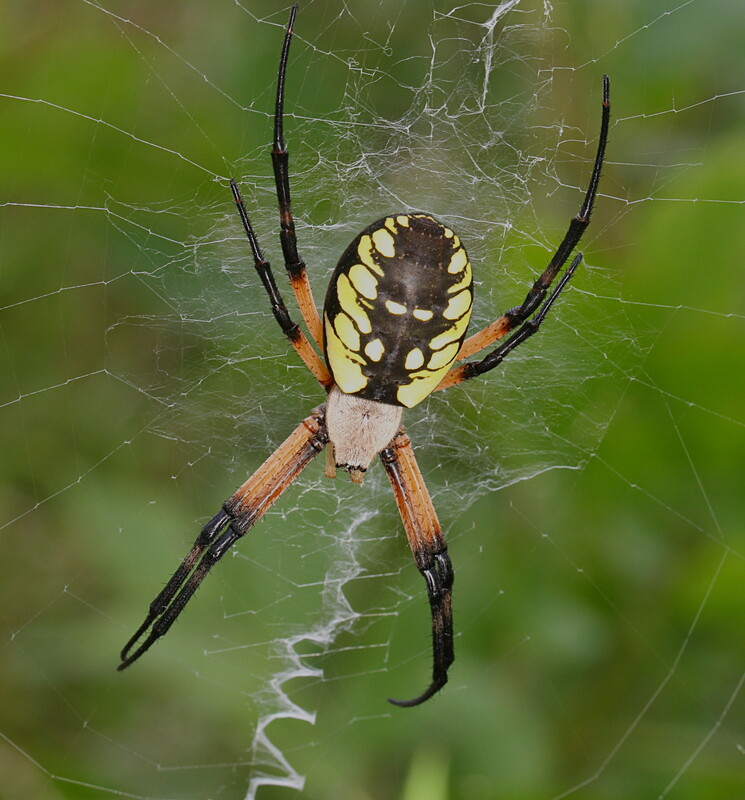 When I was growing up, my best arthropod friends included the numerous black-and-yellow argiope garden spiders (Argiope aurantia). I recalled that these were bigger than the ones where I live now, and I soon found that my recollections were true. They are bigger in Iowa! The last two pictures are of a welcome site that was very much part of my summer days while growing up: big female garden spiders next to a lake. I used to handle them and let them crawl all over me. The last picture shows what happened when a large grasshopper, disturbed by my approach, jumped and landed in the web of one of the spiders. The spider quickly wrapped it up and delicately delivered a lethal bite. The picture is one of my favorites from that summer. I later persuaded my youngest son to come out to see the spiders. He was quite impressed as he had never seen garden spiders before. To teach him what they could do, I caught another grasshopper and casually dropped it into a web, all the while chatting about what was happening. I had done this hundreds of times while growing up, and it was always fascinating. After the spider had envenomated the prey, I glanced at my son and was surprised to see that he was slightly aghast about the whole thing. 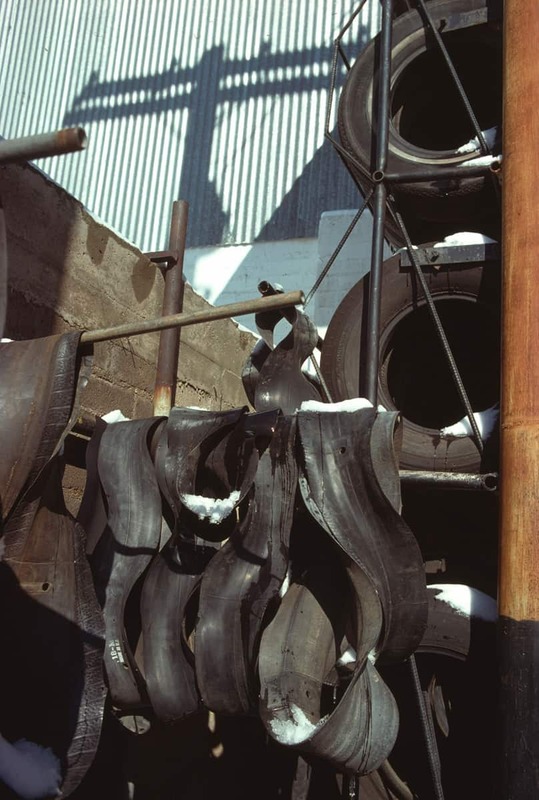 This entry was written by whyevolutionistrue and posted on December 6, 2018 at 7:30 am and filed under landscapes, photography. Bookmark the permalink. Follow any comments here with the RSS feed for this post. Both comments and trackbacks are currently closed. Very nice. 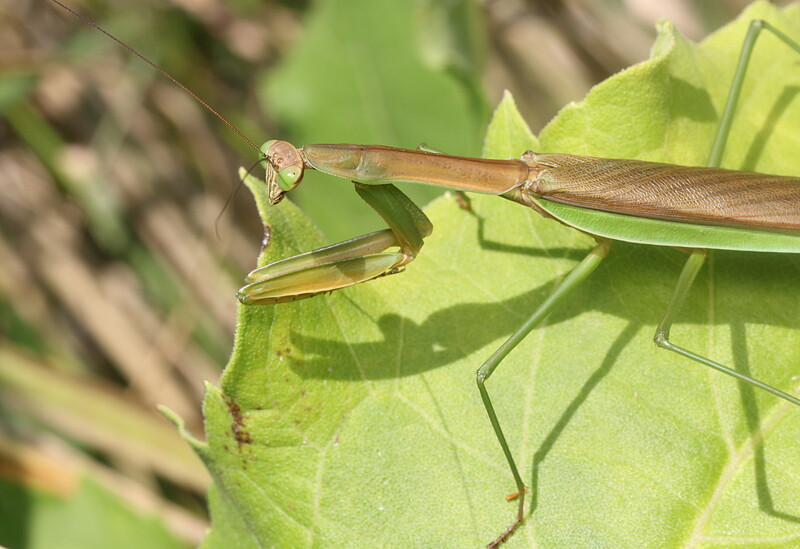 Are there parasitic wasps that lay their eggs on mantis? What IS the plural of mantis? Mantis? ! That is right. The better term is kleptoparasite, where one species steals food provisionings from another species. Although there are grey areas where the stealer also eats the other species. Wiki refers to the cuckoo as a “brood parasite”, which seems to fit the bee’s behaviour as well. Thanks both – could not recall those terms but I should have remembered them! Looking deeper, I was wrong. It seems that “brood parasites” need an element of deception of the host parents, so that they actively feed them as part of their brood, or else they are “kleptoparasites”. …the one that eats is then a parasitoid…? Ideally, ‘parasite’ is a species that lives on or in their host and does not deliberately kill them. “Parasitoid” is a species that deliberately kills its host, often by living inside and consuming vital organs. An example would be the the larvae of Ichneumon wasps, and the larvae of Tachinid flies. They are still called ‘parasitic wasps and parasitic flies’, but ‘parasitoid’ is more technically exacting. The terminology gets a bit sloppy, I think. Surprising terms for an innocent outsider. ‘parasitoids’ are meaner than ‘parasites’! The opposite of what these terms would suggest. Movie “Alien” is about “parasitoids”. I think that our president could be called a kleptoparasite, among other things. And a regular parasite, too. A ‘parasitoid’ since he’s killing his victims, the US and the ‘West’ from the inside. Amazing pictures. I also love the one with the spider and grasshopper in the web. Wonderful. Interesting ‘two-tone paint-job’ on that mantis. Blends in perfectly. Ours here in the Sierra foothills are sometimes classic green, sometimes the tan of the dry grass. Anyone able to explain the mechanism behind that? These call to mind the 11/27 NYTimes Magazine article The Insect Apocalypse. It makes one realize that insects are really important for birds and many mammals. Lol Mark! Reminds me of the time when my daughter was little, about age 4, and since I adored ballet and took classes throughout childhood and into my 20s, I automatically enrolled her in ballet class. She looked so adorable in her black leotard, pink tights and tiny pink ballet slippers. I was in heaven. After about 3 lessons, she said to me: I just want to play basketball Mom! Nice shots…I remember reading about the strange zigzag pattern in some orb weaver webs. I think it was for stabilization iirc. All are fine shots. Makes me yearn for summer(already). Wow, thanks to Mark for these! Like Mark’s son, I too felt sorry for the grasshopper. But still fascinated by the pictures. I wonder what kind of camera Mark uses? If you have to budget (like I do), then its best to spend $ on lenses, not camera bodies for close up photography. The body is the Canon T5i, which is a basic consumer grade crop sensor body. An even less expensive one, like a used discontinued model, would do just fine. I use the Canon 100mm macro, and the Canon 100-400mm Mark II telephoto. True macro lenses will cost more, but there are few bad ones out there. So an old discontinued macro or a cheaper off-brand macro lenses like the ones made by Tamron are practically equal to most fancy new brand -named macros. This hobby turns a back yard into a place of adventure and learning. Everyone should do it. Agree with Mark. Lenses and light are more important than the camera. For budget macro with very good results I can also recommend the Ratnox snap-on macro convertor. They’re cheap (around $50 for the 150 diopter) and convenient (no need to change lenses in the field. Just clip on or off). I second that. These diopters give best results if the main lens is especially sharp. A good choice there would be a small prime lens like a 50mm. Another option, which probably gives slightly better results, is to mount the small lens on extension tubes. That is how I got started. Great advice. Thanks for the wonderful photos and narratives. All are wonderful. My favorite: the dragonfly.